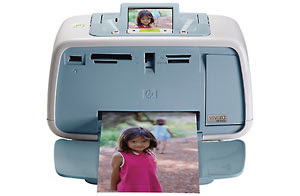 The HP A526 Photosmart printer is soo tiny it makes you wonder how on earth it can print out such nice photos!! Its been sitting on the tiny spot in the middle of my desk for two weeks now and we have printed out dozens of photos... all of which have turned out better than I ever dreamed. Perfect for the mom on the go or someone with limited space at 2.69 lbs its smaller than Melos (our smallest chihuahua) which in itself is amazing! No longer will I travel to family parties or events without it as I am SOO tired of being asked for photos that I've taken.. well now I can print them off right then and there and everyone is a happy camper! This nifty little printer will handle a 4x6, 4x8 and 4x12 print sizes and you can print photos directly from your photo card (no computer required) as it has a built in card reader for most major card types. With a max dpi of 4800 x 1200 it can meet or beat 1 hour photo prints (if using decent paper). I will say that the quality of the paper HIGHLY affects the prints. Our first prints were done on some older cheaper photo paper and they came out OK... but the good people at HP sent me over some even better HP Advanced Photo Paper and the difference is really mind blowing.. I did a side by side comparison of a photo I printed with this printer vs the photos Ive gotten from a major photo printing company and I am as happy with the HP printed pictures as I am the ones I paid money for. Though after the cost of photo paper and ink I'm not sure you save a ton of money printing your photos vs ordering them.. but the fact that you do not have to wait is well worth it in my book. Not to mention you can print anytime you want just one photo instead of waiting to print a bunch of photos online to save on shipping. The 2.4in LCD screen is very bright and easy to see (and read) and the built in menu and red eye reduction is sooo easy to use. You should have no issues using this printer regardless of your computer experience or knowledge. Both the built in software and the computer software that goes with this printer is very much computer beginner friendly. The only thing I really didn't like about this model was the lack of features compared to some of the printers HP has.. it does not have the scrap booking abilities that some of their other photo printers do.. but the cost is VERY attractive as is the size (its the smallest of the HP photo printers!). From the specs you are not loosing any resolution in print quality on this printer compared to the more expensive models and at only $99 you can pay it off in what you would have paid to order a few sets of prints. If your looking for a super small super portable photo printer and do not need the fancy scrap booking options this is the perfect printer for you! You can purchase the HP Photosmart A526 at HP as well as on Amazon. I have a small work space so I love the size. I'm an artist so I would use it mostly to print up pieces for collages and other art projects I also have three kids so family photos would also be a priority-print. Great giveaway! I like that it's portable; and we take so many pictures of our children, it would be convenient to print them up immediately.